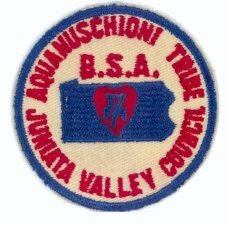 Tribe of Aquanuschioni - Juniata Valley Council, Pennsylvania - I was advised that this was NOT a society or program but was a camp only patch from 1948. The patch says Aquanuschioni Tribe and there are two varieties with one of them having "staff" on it. It doesn't seem logical that a society patch would have "staff" on it.